Heeft u een vraag voor Apple Guesthouse? Gelegen in het hart van Rivierfront, is het Apple Guesthouse een ideale uitvalsbasis om Luang Prabang te ontdekken. Het hotel ligt niet zo ver van het stadscentrum: de afstand is ongeveer 0 km en het duurt normaal ongeveer 15 minuten om het vliegveld te bereiken. Voor mensen die er op uit willen zijn View Massage, Big Brother Mouse, Xieng Muan Tempel slechts enkele van de attracties die beschikbaar zijn voor bezoekers. Bij het Apple Guesthouse staan de excellente dienstverlening en superieure faciliteiten garant voor een onvergetelijk verblijf. Terwijl u verblijft in deze geweldige accommodatie, geniet u van faciliteiten als gratis wi-fi in alle kamers, 24-uur beveiliging, post service, taxi service, ticket service. Treed binnen in één van de 10 uitnodigende kamers en ontvlucht de dagelijkse stress met een breed scala aan voorzieningen, zoals handdoeken, plasma tv, internet (draadloos), draadloos internet (gratis), rookvrije kamers. Of u nu van fitness houdt of gewoon lekker wilt ontspannen na een drukke dag, het kan allemaal in dit hotel dankzij faciliteiten als massage. Wat de reden van uw bezoek ook is, het Apple Guesthouse is een uitstekende keuze voor uw verblijf in Luang Prabang. We had a wonderful experience. On top of the owner rushing to get us from the airport (when our other transport neglected to get us), the location, rooms and service was wonderful. The location is close to the river walk, bamboo bridge, the alsm giving, and close to everything in town. We talked about renting bikes but felt like we could easily walk to everything we wanted to do! The alley location makes it quaint and quiet and I can't wait to come back! The staff here was SO friendly, they gave great recommendations of what to do. The location is perfect- close enough to the action, but far enough away to be silent at night. When I come back, I definitely hope I can stay here again! 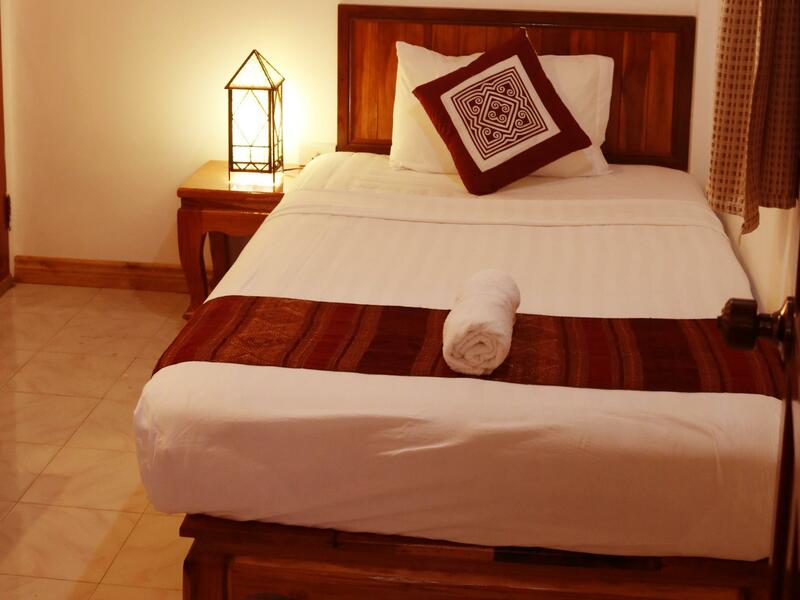 The guesthouse feels like home and surpasses all our expectations. It's our family's second time at Apple. Bounmee, his lovely family and wonderful staff showed great hospitality and helped us better appreciate Luang Prabang. The main street, Sisavangvong Road, is just round the corner. You can easily walk to the Mekong, Royal Palace, the Morning & Night Markets and access Mt Phousi. Our Standard Twin room was clean, comfortable and quiet (even in the afternoon). 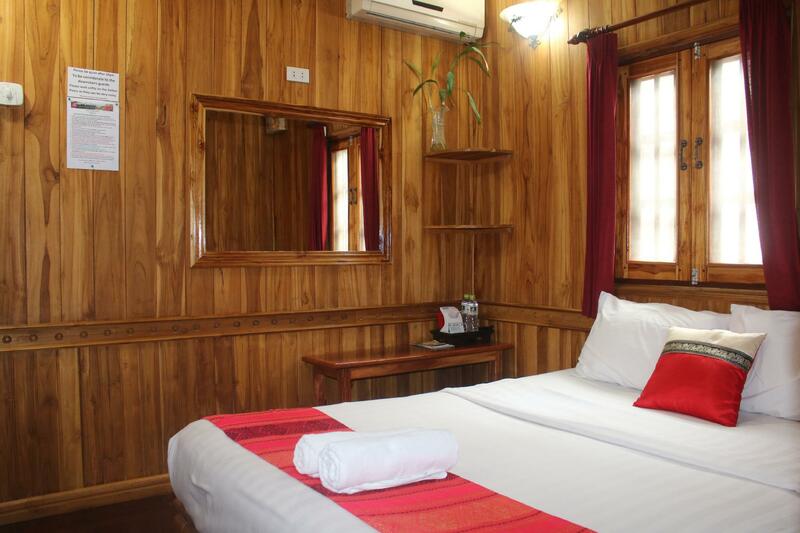 Fully equipped with A/C, WIFI, TV and fridge and a spotless bathroom! Thank you, Apple Guesthouse, we will definitely be back. I had a room on the ground floor next to the kitchen and the window to a wall. So, the room was very dark, no view and quite loud in the morning. You hear every step of persons in the room upstairs, so you need ear plugs. I think they have nicer rooms on the 1st floor. For my room, the price was a bit to high.. But it was clean (room cleaning every day), very nice staff and good location between Mekong and nightmarket! It's alright that it's a bare bones guesthouse, and it's in a great location. Aside from that, the rooms were nothing as advertised. My room was dark, the shower weak with a blocked drain. The noise from other rooms carried so I could hear snoring and phone conversation. I've been to Luang Prabang before and can say that there are better, affordable and family run guesthouses elsewhere in town worth staying. A lovely family run place to stay, up a quiet, cute alleyway, close enough to everywhere you would need to walk to in Luang Prabang. 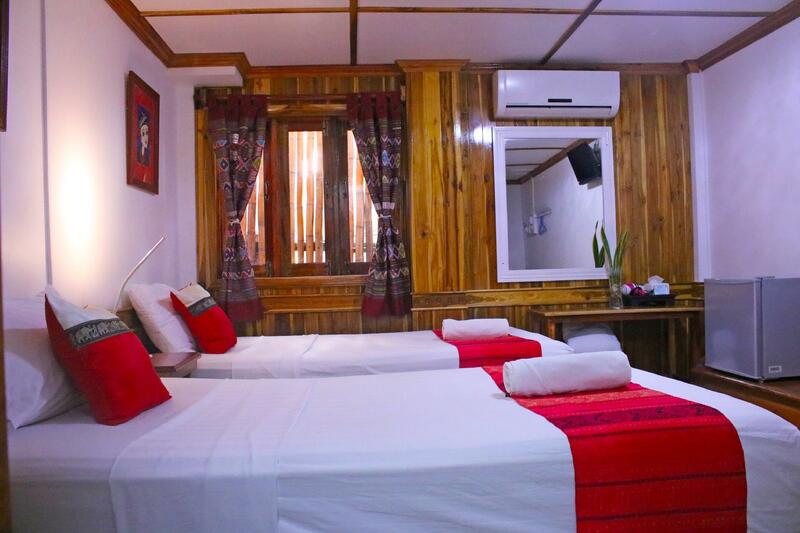 The beds are comfortable, AC and WiFi work well, clean bathrooms, in fact everything good! Friendly staff who are always eager to ask about your day in a non pushy way and offer suggestions. A nice communal balcony to have your free tea and coffees. As a mature female solo traveller I have no hesitation invrecommending Apple Guesthouse as a safe and happy place to stay. The owners and staff at Apple Guesthouse are just the best. You will not find more friendly or more helpful staff in all of Luang Prabang. They're like family to me. The rooms are comfortable with all that you need. Plenty of wall sockets, clean toilet, comfy beds, TV, A/C, etc... I only have one complaint — the WiFi is pretty weak, so you will need to bring your own WiFi solution if you need to get work done, but this is true of Laos in general. While they are slowly catching up, most places still don't offer anything strong enough to work or stream Facetime calls with. Nothing overwhelmingly special, but a very solid guesthouse with clean room, nice facilities, laundry service, and a communal balcony area on the second floor with free coffee and tea. Close walking distance to almost anything you need in the old quarter. Would stay again. Hi Philip. Thank very much for your fantastic review you have given to us, we appreciate. We also enjoyed hosting a nice person like you. we hope that you enjoy your holiday in Luangprabang, Laos. Overall we enjoyed our stay here! The staff was friendly and spoke english well. The balcony was a great spot to hang out with free coffee, tea, and hot water. Our room was very, very tiny with barely any floor space and the bathroom had a single lightbulb that made this small bathroom even more terrifying. It was overall a relaxing stay except of course for the silversmith shop banging out silver 3 out of the 4 mornings we were there. Here are lots of guest houses to stay at in Luang Prabang. So what makes this one special? The owner and his family. You could not wish for better hosts. The guest house is in a quiet side road. It is steps to the Mekong and waterfront restaurants. 5 mind walk will get you to the centre of town or the night market. It is an easy walk to the viewpoint at the end of the peninsula, and all the other places of interest are an easy walk. There is always coffee, tea and bananas available upstairs in the communal sitting area. The owner and staff are kind and very helpful. Just ask. Would definitely come back. Fabulous stay here. There was a mixup with my room but staff who spoke near perfect English was very accomodating and sorted everything out. Staff was the highlight here, very helpful and friendly for everything and gave great recommendations. The location is perfect, in a small alley a block down from the main street and the river, allowing both a central location and quiet nights of sleep. The room was big and very clean. I would definitely stay here again! This was the 4th hotel which I stayed in Luang Prabang and the best hotel ever! The reasons why I love this hotel very much is as below. 1. Friendly and at home staffs Once came by there, it feels my home because of their natural friendly attitude. 2. Great speed WiFi at room and lobby More than 5mbs. You can watch YouTube or anything smoothly 3. Clean spacious room 4. Facilities Refrigerator (we can keep and drink cold Lao beer), flat TV (we can watch CNN) 5. Tour, Tuk Tuk to airport service They offer many tours like a tour to the waterfall which are offered by the travel agencies here. The price is quite similar, so why not to ask here. 6. Location Quiet neighbor but many restaurants, shops, massage shops around this neighbor. I will definitely stay again. Believe me guys and enjoy stay there! Very nice small Guesthouse near the Mekong river. Staff is very friendly and helpful and even the rooms are a bit dark, as the neighbours are quite close, they are very nicely decorated and clean. All the major sights are in walking Distance. They also offer several tours which I haven't tried. We arrived in the middle of the night / early morning and had no problem checking in. The owners were the most lovely people I had met on this trip! They were extremely helpful with our requests (same day laundry and transport to airport) which really made our trip a lot more enjoyable after a 13hr journey there. Just a pity we didn’t stay more than one night. Highly recommend this guesthouse to any traveller!! I've been coming to Luang Prabang for 12 years. This place is especially charming, and the owners are contagiously happy people with a sweet family. The Guesthouse is named after their daughter, Apple. :) I'll certainly be back to stay again. The superior room above is especially nice, with a very comfortable balcony and couch. Cleanliness, location and accommodating staff make this my favorite guesthouse in Luang Prabang. stayed at apple guesthouse while i was passing thought laos and found this place amazing, very welcoming family vibe for the husband and wife who gave great advice on things to do and made organising day trips senseless and affordable. This was my first Experience at a guest house but definitely come back again and would recommend to anyone. Overall, I enjoyed our stay at Apple Guesthouse. The location is great and within walking distance of just about all the shops and restaurants you'd want to visit while in Luang Prabang. And if you want to go out farther, there are moto rental offices nearby. The staff was friendly, the rooms were clean, the wifi worked well, and the A/C blew cold. We didn't use the safe, fridge, or TV, but they're there. My only complain is that it can get noisy. With very little sound insulation in the walls and windows, the sounds of the neighbors talking or the customers from the nearby restaurants can get really bothersome in the early mornings if you're a sensitive sleeper. I've booked 4 nights at apple's and would definitely come back to stay if I'm ever back in Luang Prabang. Reception was very responsive in attending to our needs and could communicate fluently in English. Beds were made, bottled water replenished and towel changed ever day of our stay even though the little notice upon the table top mentioned that housekeeping will be done once every 3 days. The extra service could be accorded to us as it's the low season (April) but my party consisting of 3 elderly relatives were grateful for the extra consideration. Showers were warm with a good pressure. The only minor trouble we encountered in the downstair room is that the water drains out snail pace. We had thought something was stucked but with the very helpful reception help, we discovered that it's just how Laotian drainage works. It was solved once we flip over the metal shower strainer. Location was perfect. If you're getting up for the morning alms giving ceremony, consider stationing yourself at the exit of the hotel leading into the smaller roads (not the river exit). From the first junction on your left (where a small grocery store is) you'd get a quaint picture of the monks on their alms rounds without the throngs of tourist where the main street is. I really enjoyed my stay here. The staff were very helpful with everything I asked them. The room was nice and a reasonable price. The other guests were friendly. The only slight downside was the lack of a kitchen, but there are a large number of excellent restaurants and cafes nearby.